Gaza-area high schoolers tell Arutz Sheva that they have no plans to drop their protest of the government's lax Gaza policies. After finishing their 90 kilometers march from southern Israel to Jerusalem, Gaza area high-schoolers tell Arutz Sheva that they have no plans to drop their protest. The teens had kicked off a nationwide protest this past week across Israel to raise awareness of the difficult situation they live in. Over the past year, the Gaza area villages have suffered from rockets, mortars, and incendiary kites and balloons that have devastated the region. Gal Cohen, one of the organizers of the Gaza Strip youth protest march, told Arutz Sheva that the protest was only beginning. 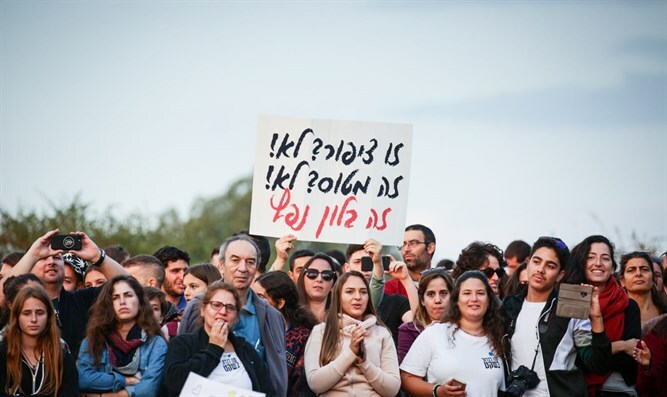 "Today we are coming to the end of our journey to Gan Havradim n in Jerusalem, but the journey is not stopping here, it is just beginning, we will continue the protest until there is quiet here," said Cohen. Cohen says that he was inspired by the support marchers received from ordinary Israelis during their treck. "Everywhere we were hosted in an exceptional way, including lodging and food," he said. "O the first night we were in Ruhama, then in Lachish....It rained on us but the group proved that it was important for them to march for their future"
"The residents of the Gaza perimeter are not invisible, they have to treat us like any other resident in the country," Cohen said. "Burning kites are landing in front of our schools and homes and this has to end."